Orange County Mayor Teresa Jacobs helped officially kick off the Central Florida Workplace Challenge, a friendly competition that will help local businesses save money, create healthier workplaces, reduce their environmental impact and enhance our community through volunteer service. Alexa Stone, founder and President of ecoPreserve, an organization with a mission to help organizations improve operations, reduce costs and achieve sustainability, assisted with outreach at the Economic Summit. The six-month long challenge will provide businesses with the opportunity to earn awards and recognition, enjoy educational and networking socials, and compete to be the best in one or more of the three categories: Green, Healthy and Involved. The competition will be based off of online scorecards where participants can earn points for completing a range of tasks designed to improve their workplaces. Those competitors who score enough points will be recognized at an award ceremony at the conclusion of the challenge. 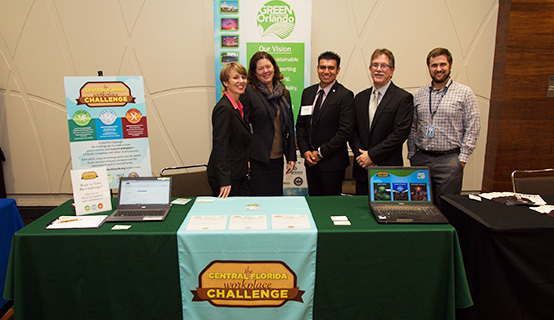 Orange County is partnering with the City of Orlando, the City of Winter Park and Green Destination Orlando, a local nonprofit, to administer the Central Florida Workplace Challenge. Opportunities to sponsor the competition are available, with either monetary or in-kind sponsorships being welcomed. Every day, more than 700,000 individuals go to work in Orange County. Many people spend more time at work than any other place. Workplaces make a big difference in our lives both individually and collectively. Healthy workplaces make for healthier, more productive and happier employees. Workplaces where colleagues volunteer together to make a difference in the community helps build teamwork on the job. Green workplaces typically reduce operating costs while decreasing environmental risks and liabilities. Pursuing the triple bottom line of profit, people and planet is good for business and good for our community. To join the challenge, visit www.greendestinationorlando.org.